Basicly everything is otherwise similar than before, only now there is proper place set for the badges, and the address typed to the rigth corner. It isen't a hotlink, as making such would make things overally complicated. But mere visual reminder to where the true bucket exists. one minor nitpick: the 'never change the drawing size of...' has the wrong size, or is this because of the badges added to the side? 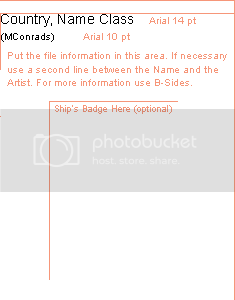 and one question: if we have ships that fit on the template, but take over part of the badge space, should it go over the badge space (if none is there) or should we take a larger template then? also, an suggestion: maybe now's the time to add an smaller template (say 50 meters scale bar) for the extremely small ships I and some others drew and will draw. 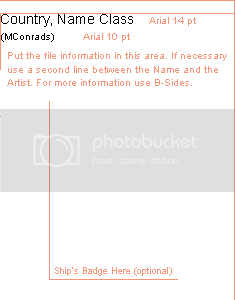 The template sizes has not been changed. Only some stuff added in. If there is errors, they were there in the orginal templates. Can you specify in what templates the given numbers are incorrect? The idea is that the ship is in leading role. If the ship and badge doesen't fit into the template, then the badge must stand aside ...or use the larger templates. In the large (XL and XXL ) sizes there is the option to adjust the length to fit for the ship. We've done quite well sofar with these sizes, and small boats have been drawn allready in these basic sheets without any proplems. Also, all sort of RIBHs, dingies and ship's boats belongs to the part sheets, not among the true ships. This scale has its minium limits after all. If the guidelines for ship's badge were like this instead of this then badges of different sizes would end up on the same distance from the top of the image. I think it would make drawings look neater. I need to test which one would look more aesthitical, but part of the tigth selection is to urge people to drawn smaller crests that wouldnt take 1/3 of the image size. You may use one of my drawing to test it out! I've changed my drawings of Fort Austin, Argus, Albion, Bulwark and Iver Huitfeldt to the new template And the next expression of Diligence will be in that template too.